Born: March 6, 1855 in Providence R.I.
Died: February 16, 1935 in Pocasset Ma. at 79 yrs, 11 mos, 10 d.
1. Jarvis Cushman Gibbs, Jr.; (April 17, 1880 – April 2, 1962); Married (1) Mabel F. Robinson (1878 – ?) (Edwin F. Robinson & Harriet/Hattie A. Hamilton) in Falmouth Ma. on March 15, 1899 & married (2) Helen/ Nellie Agnes Leahy (1885 – 1979) (Michael Leahy & Bridget Carol) in Pittsfield Ma. 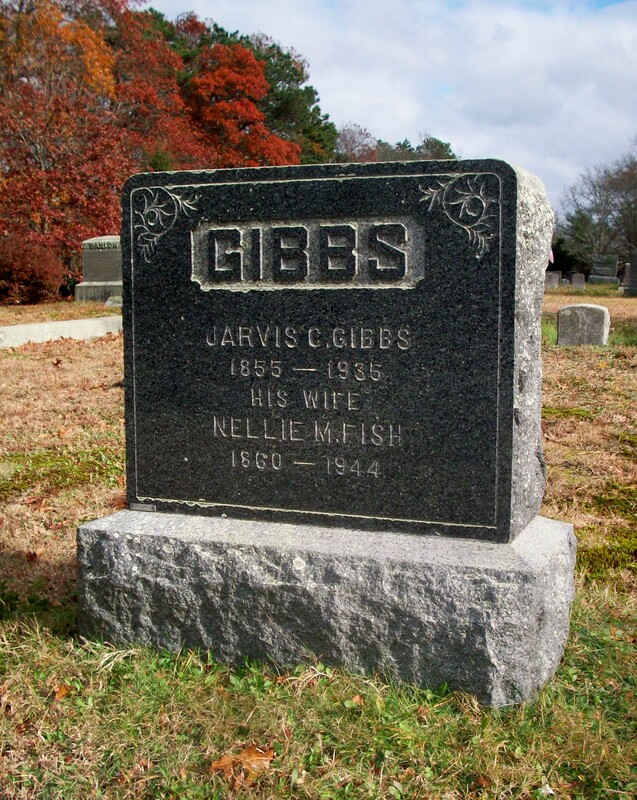 in 1926; Jarvis, Jr. & Helen/Nellie are buried in Pocasset Cemetery. 2. 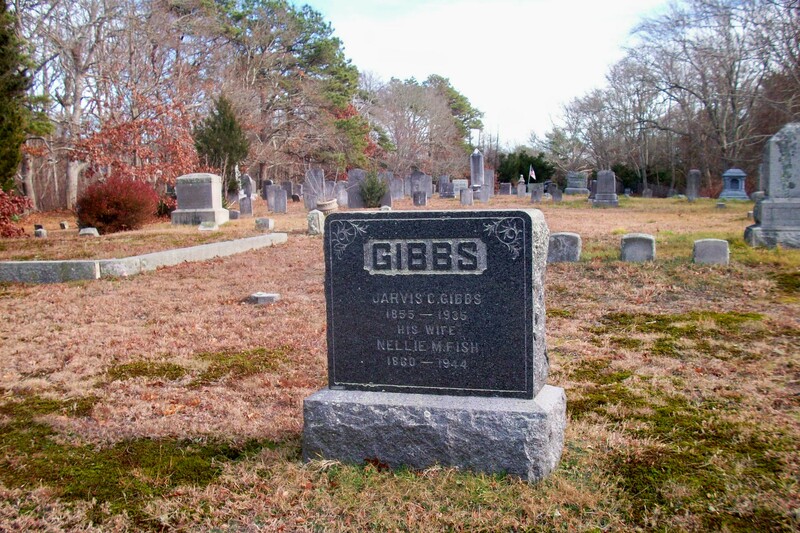 Arthur Garfield Gibbs; (September 17, 1881 – April 1948); Married Elizabeth/Lizzie May Gardner (1885 – 1970) (Stephen Gardner & Sarah Jane Bowline) in Bourne Ma. on November 5, 1905; Elizabeth/Lizzie is buried in Pocasset Cemetery. 3. Mildred Evelyn Gibbs Smith Pells; (July 3, 1884 – 1942); Married (1) Arthur Leroy Smith (1887 – 1948) (Israel Mozart Smith & Luella Frances Maxim) in Carver Ma. on June 30, 1907 & married (2) Addison Rodney Pells (1888 – 1948) (James Henry Pells & Addie L. Oakley) in Barnstable Ma. on September 7, 1916; Addison married (2) Bertha Alice Dunbar (1889 – 1938) (Napoleon Dunbar & Susan Alphonsine Goatsey) in Barnstable Ma. in 1932; Bertha married (1) William Cornish Baker (Eben Nickerson Baker & Rose Crocker) in Cotuit Ma. on December 24, 1906; Mildred is buried next to her sister Helene Hammond in Pocasset Cemetery. 4. Lillian/Lilith May Gibbs Gardner; (February 11, 1889 – February 18, 1976); Married Arthur Robin Gardner (1882 – ?) (Richard J. A. Gardner & Mary A. R. Ahmar) in Cotuit Ma. on December 9, 1912; They had 6 children & lived in Billerica Ma..
5. Victor Walton Gibbs; (June 12, 1891 – March 15, 1940); Married (1) Winifred Lewis (1885 – 1917) (David Swanson Lewis & Caroline A. Weld) in Rochester Ma. on April 19, 1917 & married (2) Katherine E. Moriarty (Abt.1891 – ?) in Abt.1920; Victor & Katherine had 3 children. 6. Helene Frances Gibbs Hammond; (December 25, 1899 – February 5, 1998); Married George Burnside Hammond (1899 – 1982) (Harry Burnside Hammond & Mary Allina Bowman) in Bourne Ma. 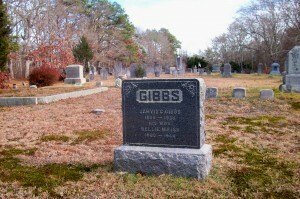 on April 29, 1922; Helene & George & their daughter Elizabeth H. Davis are buried in Pocasset Cemetery.